One of the things that I did not anticipate about the response to Creative Capital is the degree to which it has been resonating in a downturn. Timing, like in most endeavors, is a pretty crucial factor in book publishing. And I remember thinking before Creative Capital came out in the spring of 2008 that I was glad the U.S. economy still seemed to be doing well. But then the economy began to lose steam over the summer. The housing market continued to deteriorate. And before you know it, it was September and Lehman Brothers had gone bankrupt and Merrill Lynch sold itself in a fire sale. The U.S. had plunged into a deep and scary recession. Suddenly, America, a nation of future-oriented amnesiacs, became obsessed with history, and, in particular, with the history of economic crisis. The surprising thing, for me, was that the financial panic changed the way I thought and talked about the book, and the way people viewed it as well. Virtually overnight, my chapters on the Great Depression, and World War II, and my chronicling of multiple recessions and their inter-relationship with the nation’s entrepreneurial economy in the post-war period took on a new significance. True, one of the key arguments I make in the book was that the venture capital industry itself was born in response to the Great Depression. And that Silicon Valley was created in the midst of the nasty recession of the mid-1970s. But the more I thought about today’s troubled times, the more I came to see that the history of innovation and economic downturns were in some ways inextricably linked. I came to see that some of the most successful companies were hatched or developed during a downturn. I developed a somewhat contrarian perspective based on my study of the past. And those insights continues to shape my work as a journalist today. All this is a way of saying I am gratified that readers of the book agree with me that the story of Georges Doriot and the instrumental role he played in building our nation’s entrepreneurial economy still has lessons to offer us in today’s turbulent times. On that note, please check out these two reviews from my Amazon page. Both reviewers gave Creative Capital five stars. One is written by Robert Ackerman, a successful venture capitalist who is managing director and co-founder of Allegis Capital. Their reviews must be having a positive impact. Amazon says there are only three copies of my book left in stock! Spencer Ante’s biography of Georges Doriot left me cheering my head off! He would look at the mistakes of today’s politicians and bank leaders and tell them exactly what they had done wrong and why and it would not be double talk. This is a great read about a true genius of business who came here from France and tried to teach how to be effective capitalists instead of idiot pretenders. It’s too bad we didn’t learn when we could have. We wouldn’t be in this mess now. 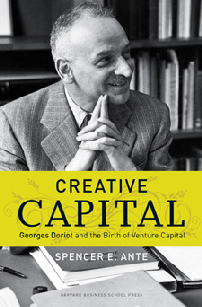 In his book Creative Capital – Spencer Ante not only captures the amazing story of a French immigrant (Georges Doriot) and his profound contributions to the United States in business education, government service and launch of the systemic US venture capital industry, he also distills the essence of entrepreneurism and its pivotal role in innovation and the growth of the US technology industry. By embracing creative ideas and pro-actively managing the risk inherent in bringing new technologies to market, Doriot demonstrated that economic growth and wealth creation are at the heart of the venture capital model and two sides of the same coin. At a time when the US economy is looking for direction and the keys to its future growth and sustainably, Ante’s book is a must read for every politician, business leader and investor who is genuinely looking for the levers through which we can grow and extend our competitive advantage in a global economy. After reading Creative Capital, the question that comes to mind is “how can we proactively encourage more of the innovation that Doriot helped bring to life”. Ante’s style delivers a great story in an easily readable format punctuated with data and facts that draw clear comparisons to the economic challenges we face to day. Over the course of his long career, Doriot participated in many committees. And he usually despised them. “A committee is an invitation to do nothing,” was one of his famous maxims. But perhaps no committee was as important as the New Products Committee. It wasn’t so much the work of the Committee that mattered, though they did undertake a series of important studies. More so it was the fact that it assembled the brain trust of individuals who would eventually pioneer the venture capital industry. The outcome of the Committee was the creation of the New England Industrial Foundation. The Foundation’s goal was not to invest in new enterprises but to create a sort of industrial research organization to “appraise opportunities for scientific enterprises in the New England area.” After spotting those opportunities, the Foundation hoped existing New England businesses would then invest in and nurture them. Around the same time, Doriot joined forces with another group of elite New Englanders working on the same problem: Enterprise Associates. Led by William Coolidge, an American physicist who in 1916 invented the prototype of modern X-ray technology, Enterprise Associates took a more direct approach than the Foundation, raising $300,000 from twenty stockholders to finance the final stages of promising research projects. Doriot joined the board of Enterprise, along with his Business School assistant William H. McLean, and a few others. Throughout 1938 and early 1939, the stockholders and officers of Enterprise met with various entrepreneurs, looking for ideas to finance. On May 7, 1940, they held a dinner where they learned about a young chemical company called National Research. They liked the idea and backed the firm. Then history threw a wrench in their plans. On May 10, Germany invaded Luxembourg, Belgium, the Netherlands, and France, ending the so-called Phony War. Right after Germany unleashed its blitzkrieg on the rest of Europe, most of the people who attended the Enterprise dinner called up William Coolidge and told him they wished to withdraw from their participation in the financing of National Research. Coolidge refused to withdraw. Since he had made a commitment, he would follow through with it. Doriot, feeling bad, loaned them an assistant to help, and later joined National Research’s board. But it made little difference. The United States was facing a far graver risk—global fascism—and she needed to devote all of her energies and resources to fighting this dangerous and growing scourge. Enterprise Associates and pretty much everything else unrelated to the war were put on the back burner. Still, the experience of Enterprise Associates taught the venture industry’s pioneers an important lesson. “[The Enterprise] experience made Merrill Griswold and Karl Compton realize that it might not be a good idea to have a company with only enough money to find and study projects, then ‘to pass the hat’ for capital to start the new company,” explained Doriot. A company should have its own capital, they concluded. That way, it would be insulated from events outside of its control. For the time being, though, the war had snuffed out the formation of the nation’s venture capital industry just as it was getting off the ground. Six years later, Compton, Doriot, and other members of the New England brain trust would revive their plans to create a regional venture movement. But first, they all had a war to fight. On January 12, 1932, Doriot was invited by Major General Fox Connor to give a lecture to a large audience of regular Army, National Guard, and Reserve officers at Harvard’s Baker Memorial Library. After several years of lectures, Doriot had established quite a reputation in the military. Doriot ended the speech by calling for the creation of a “chief of natural resources as well as a chief of manufacturing” to help manage the coordination of wartime production needs. But, as with so many other visionary speeches he had delivered over the years, Doriot’s warning and calls for action fell on deaf ears and empty government coffers. Doriot expressed hesitation about the offer to Lewis Strauss. “This does not mean I have decided to go with them,” wrote Doriot, “but I have realized that they were in very close touch with many companies that might require good banking connections, and after all, since I am still free and ‘my soul has not been sold’! it is normal that you should be the good banking connection.” In early 1932, after careful consideration, Doriot declined to take the job, but he did accept his first consulting job. For Doriot, the rest of 1932 did not bring much excitement. The real action was in Washington. All eyes were on the nation’s capital as it was consumed with the presidential election of 1932, pitting the incumbent Herbert Hoover against the urbane democratic governor from New York, Franklin Delano Roosevelt. It was landmark election that realigned the political landscape of America, ushering in a new era of activist government. And Doriot was eager to be involved. After becoming a full professor at Harvard, Doriot began to take a greater interest in the nation’s public life. In his speeches before the military, and in various articles he wrote or committees that he joined, we see a man becoming increasingly interested in using his power to shape public policy. One theme emerged as a leitmotif: like many businessmen of the day, Doriot was a critic of big federal government. “American businessmen are now handicapped as a consequence of the stupid regulation which now exists,” said Doriot to one reporter in 1932. In March, Doriot wrote Lewis Strauss and asked him to open a bank account for him. What seems like an unusual request today was actually a shrewd maneuver. In the early 1930s, the banking industry was in the throes of a crisis. With hundreds of banks declaring insolvency, Doriot tapped Strauss for his knowledge of this troubled industry. “Would you be willing to open an account for me in a bank which you think has a fair chance of remaining in existence for a period of months?” asked Doriot. “If the bank you pick should close two minutes after the account is opened, I shall not feel badly but shall merely come to the conclusion that it could not be helped.” The amount that Doriot deposited in the account showed the meagerness of his savings. It was only $3,500, less than a year of salary. In June, at the height of the Depression, Doriot stepped up his attack on big government by slamming one of the key legislative proposals of the New Deal—the National Industrial Recovery Act. Passed on June 16, 1933, the law created the National Recovery Administration (NRA), an executive agency with the power to create “codes of fair competition”—codes which were intended to reduce destructive competition and to help workers by setting minimum wages and maximum weekly hours. The NRA, symbolized by the blue eagle, included a rash of regulations that imposed pricing and production standards for all sorts of goods and services. But the codes allowed cartels to be established in many industries. And as NRA-associated firms increased their prices, sales fell, employment fell, and the recovery stalled. Most economic historians today consider the NRA to be a resounding failure but many respectable business groups praised its passage, including the U.S. Chamber of Commerce and leading labor organizations. Not Doriot. The professor believed in the collective wisdom of the market, not government bureaucrats. To carry out its provisions, Doriot said the United States would have to go “all the way to Bolshevism, which none but an insignificant minority wants in America.” Doriot criticized many aspects of the act but the worst feature for him was that it gave the government the power to lend money to struggling businesses. “Bankers, and not the government, should determine what industries are worth saving,” argued Doriot. This time, Doriot hit the nail on the head. The professor correctly saw that the newly elected Roosevelt—and the government—had overstepped their bounds. But Doriot did not have to wait long to be vindicated. The law was so poorly conceived that on May 27, 1935, the Supreme Court overturned the NRA in a unanimous decision, ruling that it infringed upon states’ authority and gave powers to the executive branch in violation of the Constitution. The NRA quickly stopped operations. Doriot’s campaign against the agency marked the first of many battles he would wage against the federal government, and what he felt were its misguided intrusions into the free market economy. In January 1931, after the Doriots returned to Cambridge from their unorthodox honeymoon, Georges needed to find a new place to live with his wife. They soon found an apartment in Cambridge. The first Sunday after they moved in, a throng of friends and colleagues called on them. Doriot, the self-described “most unsociable bachelor,” never led much of a social life, allowing most of his evenings to be consumed by work. This history made his colleagues and their wives even more curious about Doriot after he got married. Friends and coworkers continued to drop by their apartment to see the quirky professor and the woman who had agreed to marry him. So, after a few weeks, having realized that “all my evenings would be wasted and I could not do any work,” the Doriots cancelled their lease and escaped to the Hotel Bellevue in Boston, where they stayed while Edna looked for a new apartment less central to the Cambridge social scene. Even though Doriot was a professor, he and Edna led a spartan lifestyle. In the early 1930s, Doriot made about $4,000 or $5,000 a year, a comfortable middle-class income. But that security was compromised by the obligation he felt to regularly send money home to help take care of his parents and sister. Still, the Doriots had it better than most Americans. In 1931, when the Great Depression kicked in, the U.S. unemployment rate surged to 16.1 percent, tripling from 3.1 percent in 1929. By 1930, breadlines broke out as desperate people lined up for free food doled out by states and cities. Hoovervilles—those shantytowns comprised of hundreds of shotgun shacks cobbled together with cardboard boxes, egg crates, or corrugated tin—began sprouting across the American landscape. If Georges had strolled by Central Park’s Great Lawn on a visit to New York, he would have gaped at a vast squatter’s village with thousands of “utterly spiritless” people, in the words of writer Joseph Mitchell. At least Georges and Edna had a job, a roof over their heads, and money to pay for food and clothes. But they still pinched every penny. At the Hotel Bellevue, Georges and Edna studied the breakfast menu very carefully to see whether they could find a breakfast that would feed the both of them. Porridge, they learned, was the best choice. As for beverages, they concluded that tea was preferable to coffee. Coffee would usually yield one cup of drink, but a teapot provided enough water for two cups. Luck, that mercurial commodity, was in short supply during those bleak times. One day, Edna splurged and bought a bigger heater for their living room, but when Georges placed the heater on top of a glass table, the glass broke. A short while later, Edna found an attractive apartment at 5 Arlington Street in Boston. It was a second floor unit with a balcony overlooking a garden and three high-ceilinged rooms. Most importantly, it was finally a place they both liked. “At the time there were few automobiles running on Arlington Street and we were not annoyed by their noise or smell,” said Doriot. Late in 1931, Doriot became transfixed with the idea of globalization, or as he called it, the “international mind.” He viewed the increasing interdependency of the world as a means of maintaining peace. In a series of articles and speeches, Doriot developed these ideas, and his remarks received significant coverage by the press. In one essay picked up by various U.S. newspapers, Doriot boldly called for the internationalization of all transportation systems in Europe—air, railroads, and steamships—as the most effective way to promote peace in that war-ravaged continent. By merging these transportation lines into a unified system owned by a group of international investors, Doriot argued that it would create a more efficient transportation network and, more importantly, “make national secrecy impossible and tend strongly to minimize national jealousies.” World peace could not be produced through political negotiations, he felt, but through industrial cooperation and coordination. In November of 1931, Doriot expanded upon these ideas in an address he gave to the Two Hundred Fifty Associates of the Harvard Business School, a group of well-heeled donors. The address, titled “French and German Crisis,” offered a comparative analysis of the strengths and weaknesses of the French and German economies. In order to keep France and Germany from waging war against one another, Doriot proposed the formation of an international bank that would be given the power to “control and investigate all international loans.” By this means, loans intended to finance military purposes would be greatly hindered, thus preventing the suspicion that leads to a secret run-up to war, as had happened during the Great War. Some of Doriot’s high-minded ideas would eventually become realities, but once again he was too far ahead of his time. In just a few years, European nationalism would reemerge with a vengeance, making a mockery of his pleas for cooperation. In the agonizing four-month interval between the November 1932 election and the inauguration of President elect Franklin Roosevelt in March 1933, the American banking system shut down completely. Outgoing President Herbert Hoover repeatedly beseeched FDR to do something, anything, to calm the public. FDR demurred over and over again. Fear and panic filled the void. Back in 1933, Americans across the country, realizing that Washington was stuck in a state of deadening paralysis, “scurried to their banks, queued up with bags and satchels, and carted away their deposits in currency or gold,” wrote historian David M. Kennedy in his Pulitzer Prize winning book, Freedom From Fear. To stem the panic, states declared banking holidays. By inauguration day, government decrees had shut down every bank in 32 states. Today, I don’t think the banking system is as bad off as it was in 1933, though it does appear to be weakening. But we do face a whole new raft of risks. One, we are still facing a liquidity crisis. Without a federal stimulus packages or some sign that the government is willing to pump up the economy, credit markets could remain paralyzed and banks could remain unwilling to lend. Two, we are still facing a crisis of confidence. Deflationary powers could strengthen and wipe out even more jobs. Without strong government action over the next 90 days, the stock market is likely to continue to drop, zapping wealth and making consumers less likely to spend, forcing more companies into restructuring or bankruptcy. Three, we are facing a car crisis. Washington needs to apply its power to force a restructuring of the automobile industry–and avoid a chaotic flameout could send unemployment into near–Depression era levels. The question is whether or not Detroit–a crucial industry and national security asset–needs to be put through bankruptcy in order to do so. The emerging consensus seems to be, yes, a pre-packaged and orderly bankruptcy would be the best course of action, and I tend to agree with that. Congress did the right thing by denying Detroit a bail-out. Now, it needs to help revamp Detroit and create an industry that is truly competitive. But acting now is crucial. This week, two of the three CEOs of U.S. car companies basically admitted they are teetering on the edge of bankruptcy. Against this darkening outlook, it comes as a welcome relief to see Barack Obama accelerating his transition plans and proposing a more aggressive stimulus package. It shows that he is not following one lesson of FDR: stiffing the American public for political gain. Hardly anyone remembers that FDR put politics over the American people before he took over office but his lack of action caused a lot of pain for a lot of people. Obama campaigned on the premise that he would put the people before politics. That solving America’s problems was more important than scoring ideological or political points. This is his first big test and chance to prove that he was not blowing smoke. There are many lessons to be learned from this time. And now that we’ve all suddenly become students of history, I want to share some of the ones I’ve learned. So, with the blessing of my publisher Harvard Business Press, over the next week or so I am going to serialize Chapter 5 and publish it on this blog. My hope is that the experiment sparks a conversation about that period and gets us thinking about how we can avoid slipping into a deeper economic funk and lead the country back onto a path of prosperity. As we pick up the story, Georges Doriot, is a 30-year-old native of France who transformed himself over the course of the last 10 years in America from a young immigrant into a distinguished professor at Harvard Business School. When Doriot returned to Harvard in the fall of 1931, he could look back on the past decade and smile with pride. In the relatively brief span of ten years, the young immigrant had conquered a new country. Not only had he found a profession that brought him satisfaction and security, he had earned a reputation as one of the leading lights of the most important business school in the country; he had spearheaded the creation of a successful new business school in Paris; and he had found the love of his life and convinced her to marry him. And yet there was still a fire that burned in Doriot, a passion that kept him searching for his next mission impossible. Perhaps that is why the 1930s—a time of diminished expectations for the entire nation—were probably the most frustrating period of Doriot’s life. He was always at his best when tackling an impossible job, but during the Great Depression, despite several attempts, Doriot never found a grandiose task to throw himself into as he had done so many times during the previous decade. At times, a similar mood of discontent permeated the home of the Doriots. The 1930s would have been the ideal time for Georges and Edna to start their own family. But the Doriots never did have a child. Nevertheless, the 1930s were hardly a lost decade. In retrospect, for the Doriots and the rest of the nation, it was a time for hunkering down, for planting seeds that could be harvested in the future. Indeed, the years of the Great Depression hold the answer to another great mystery of Doriot’s life: How did a man with hardly any experience running a business come to be such a world-class businessman? The answer is that during those years, dozens of companies hired the professor to help guide them through the worst disaster that had ever hit the American economy. In that dark decade, Doriot gained a lifetime of experience as an officer, director, and consultant. Between 1932 and 1941, when he was called up to join the military, Doriot served on the boards of twenty companies, while taking on executive-level positions in ten other firms. It was an astonishing volume of outside work that would never be allowed in today’s age of vigilant corporate governance.